My curiosity is definitely peaked by Imaginery Fiends. Part of its premise is based on the real life true crime story about two girls who attempted to savagely kill a friend in order to appease the Slender Man. The incident brought to the light an aspect of the life of pre-teens and what goes on in that secret world. There’s also a documentary. It will be interesting to see where the creators take the story. 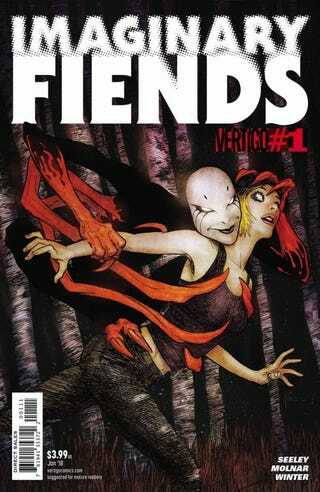 Imaginary Fiends #1 - “Polly Peachpit.” Those were the words ten-year-old Brinke Calle said when she was found covered in her own blood by the woods in rural Cannon Falls, MN. Her best friend, Melba, had just attempted to murder her because a spider girl named Polly Peachpit told her to. Since that day, Melba has spent seven years in a mental health facility. Tomorrow is her eighteenth birthday. Tomorrow, she’ll be transferred to a federal prison. Tomorrow, her real sentence will begin. Stalked by the insane Fazecat, our heroes adventure through the ruins of an ancient conflict—unaware that a fresh war is brewing between their tribes back home. The Unsound #6 - As the survivors fall around her one by one, Ashli begins to wonder if she’s the one killing them. God Complex #2 - As Seneca investigates an attack by the church on the digital alter-realm known as the Stream, his world is turned upside down by the emergence of the resistance—a group sworn to oppose the sinister Rulers and all they stand for. And when tragedy strikes, Seneca is forced to enter the wiretapped world of the Fates, who use predictive analytics to foresee his ultimate fate! The secret of Terry None (maybe)! The return of old enemies (usually)! Casey eats S**t (again)! Strange babies (possibly)! Ungrateful cats (predictably)! Robotman punches stuff (of course)! Negative Man goes dark (potentially)! New life and anti-life (because)! All of this and none of it happens as reality begins to transform for the Doom Patrol. The stage is being set32 for the stage to be reset and you’re not going to want to miss the ambulance or you’ll never get to the theater on time.